The Album Road quilt block is actually two blocks in one. The centre is made up of a nine patch small block which is then set into the main block. 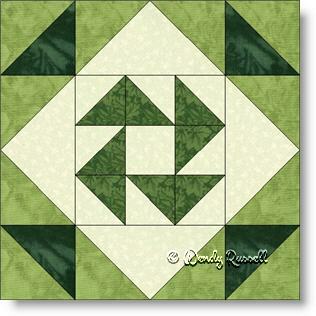 This block introduces you to flying geese patches in the outer edges and lots of half square triangles. As long as you use precision in your sewing of the quarter inch seams there is nothing difficult in the construction of this block -- made as an uneven nine patch. The fun of this quilt block is changing up the fabrics. I have chosen to make the samples in shades of green but this would make a spectacular scrappy quilt. The added bonus in making a scrappy version is that you use up those remnants from other projects and thus, make room for more fabric, A win-win situation!